I am very excited to be presenting a new work for our annual eye lounge members show opening March 16th, 2018. This work is the result of an experiment in incorporating sound and video into a sculptural assemblage, a first for me within my practice. I was reflecting on the ritual of storytelling and the strange, serendipitous ways the world reveals itself to us, building upon previous themes of memory, place and landscape in my work. 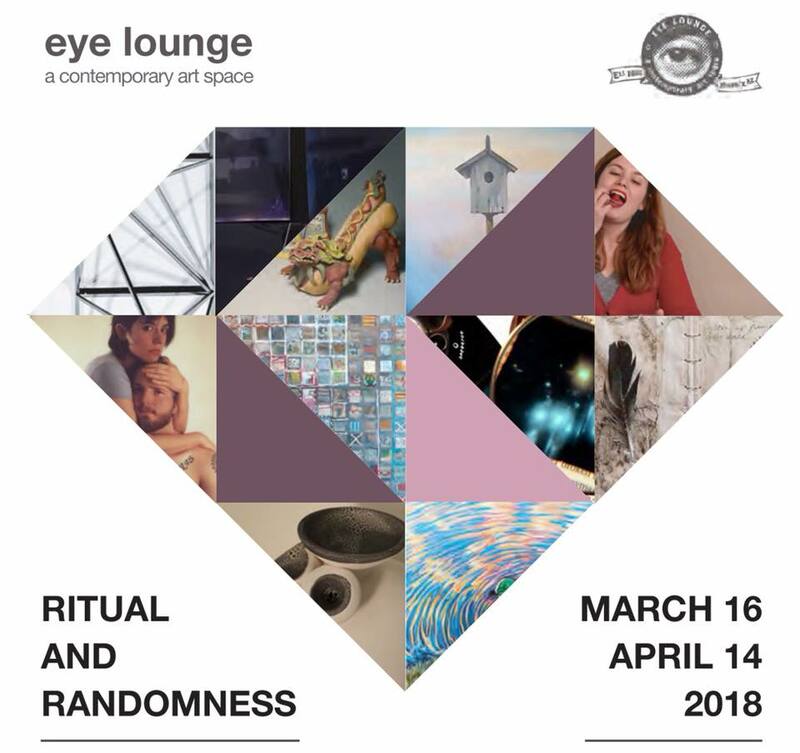 Eye Lounge is pleased to present Ritual and Randomness, an Eye Lounge members exhibition during Art Detour. As a society, we typically think of ritual in terms of life’s big events – births, weddings, deaths, religious rites, and so on. Generally, we don’t consider the behaviors of our life as ritual, particularly the repetitive every-day ordinary behaviors as something other-than or greater-than itself. This exhibition is designed to make you consider the ordinary as the extraordinary, the ordinary as something more than itself. To reconsider the randomness of our actions, events, or behaviors with fresh eyes, a new perspective, and introspection. To question the ritual and randomness of your own life. Eye Lounge is a central Phoenix artist-run collective gallery that often pushes the boundaries of art. The gallery is committed to fostering emerging and established visual artists. Ritual and Randomness is a member exhibition of personal exploration and questioning. Exhibiting members: Samantha Lyn Aasen, Kit Abate, Bob Allen, Malena Barnhart, Ashley Czajkowski, Tawny Kerr, Ellen Nemetz, Kazuma Sambe, Tess Mosko Scherer, Kim Sweet, Rossitza Todorova, Danielle Wood. Hello all! Our annual members show is happening now at eye lounge. I've been busy these past weeks curating this exhibition and making a brand new installation piece. If you're in the Phoenix area, the exhibition continues through April 16th! "I want to believe that everything rots for a reason / that the periodic table of elements / is a book of vegetarian recipes in various states of decay"
eye lounge is pleased to present sub rosa, an exhibition of new work by Tawny Kerr, a member of the downtown Phoenix collective. Sub rosa is a collection of Tawny Kerr's recent ephemeral sculpture and installation work investigating themes of memory and nostalgia. Her work represents a struggle between an inward desire to preserve and the destructive reality of passing time. Kerr uses materials ill-suited to archiving - flowers, candy, delicate thread and old, brittle paper; fragile materials which display evidence of wear and decay. In embracing impermanence, Kerr further emphasizes the fallibility of memory, questioning both the strength of memory through the passage of time and the reliability of the narrator. Sub rosa is the first solo US exhibition of Tawny Kerr's work. The exhibition will run from July 15th through August 13th, 2016. The artist will host an opening reception on Friday, July 15th from 6 – 10 pm, and will be in the gallery for First Friday on August 5th, 2016, during regular eye lounge hours, and by appointment. eye lounge is located at 419 E Roosevelt Street in Phoenix. The gallery is open Fridays from 6 - 9 pm, Saturdays 1 - 5pm and Sundays 11am – 3pm and during MADE gift shop hours. I'm very excited to announce that my work will be accompanying Rosemarie Dombrowski's stunning poetry on the cover of her forthcoming collection, The Philosophy of Unclean Things! Preorders are available now from Finishing Line Press.